The X Factor competition is one of the most hotly anticipated TV talent shows in the UK, always producing some top pop star talent every year without fail. It’s one of those shows which tops the TV ratings year in, year out, overloads Twitter and has been a massive success since its launch in 2004. However as we know, it is not only the contestants and their talent which entertains us… it is the massive competitions & prize draws the show offers to us, the viewers at home! The latest questions and answers to all the biggest TV competitions can be found here. How Does The X Factor Competition Work? This is another itv competition and works in a similar manner to all the others; a prize draw is announced on the show. You then call a number, send a text or go online to submit your answer. Alternatively you can enter the competition via post which is usually the cheapest entry method when premium rate entry methods are involved. Thats where we come in. At TV competition we publish the best TV competitions. We also provide the question & answer (if there is one) which you may need in order to enter ie. TV shows that you may have missed and deadlines for entry. 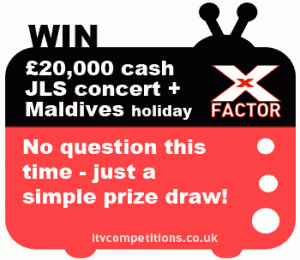 So don’t panic if you miss the X Factor competition or any others – just swing by and pick up the links, questions & answers to all your favourite TV comps! The other thing is that with these competitions you can usually enter more than once; how many times you can enter varies from comp to comp and there are often bonus entries involved. We recommend checking out the promoter T&Cs at itv.com/win before entering as they do change. From the comfort of your sofa, you have the chance of free entry to one of the biggest UK itv competitions (so long as you enter online and not via phone / text). Simply watch the show and the viewer competition is usually announced towards the end. But if you miss it, don’t worry as we’ll post all the details here for you to enter when you’re ready! Where Did The X Factor Come From? Simon Cowell brought XFactor to us in Autumn 2004 an has become the greatest pop star talent show in the world. It is judged by a panel of superstar judges, including Cowell himself and the audience/viewers and there have been other series all over the world including the USA and Australia. After getting through the initial “audition” stages of the contest, the wannabes head off to “boot camp” with one of the judges and are intensively mentored and return for a series of live shows. The overall winner is awarded a huge, £1,000,000 life-changing record deal. That’s roughly it – if you want to know more wikipedia have a huge amount of information on all the shows, judges, winners etc! What Prizes Can Be Won By Viewers? It’s all well & good that the X Factor competition winner gets a £1,000,000 recording deal, however what prizes can the viewer win? The general format for the viewer competitions has been fairly similar over the recent past; £20,000 cash plus a massive trip to a concert (sometimes the X Factor itself). This won’t be an ordinary coach-trip to a gig; its first class all the way baby! Treated like stars and the best tickets in town, sometimes even a luxury holiday and music gadgets are thrown in too! 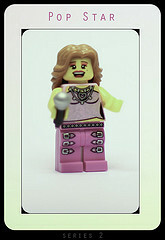 Best of luck with your X Factor competition entry!